Apple will report their fiscal Q1 ’19 financial results after the bell on Tuesday, January 29th, 2019. If readers look at the above table, they will see that both Apple’s EPS and revenue consensus peaked for 2019 with the October ’18 earnings report and have steadily declined since. The 2019 Street EPS consensus has declined 13% while the 2019 revenue estimate has declined 7%. 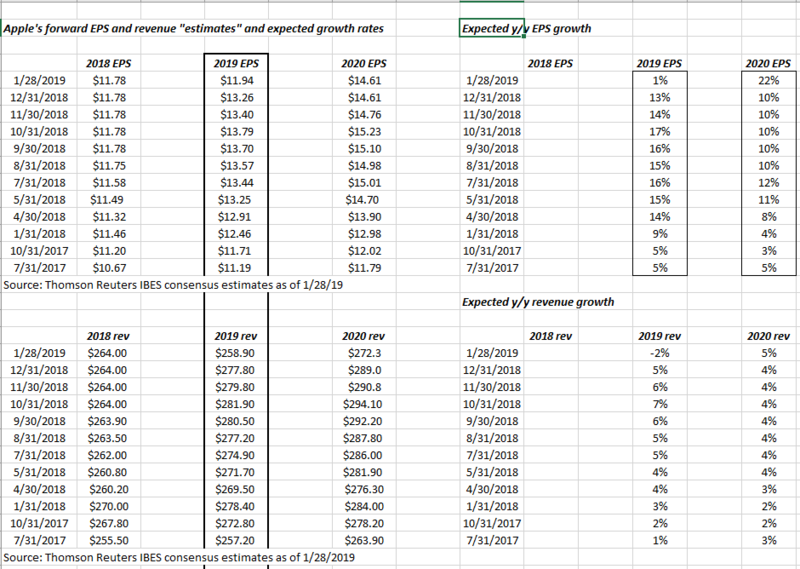 Assuming that fiscal ’19 is shot and is a transition year for the iPhone, what I’m watching is the 2020 consensus numbers: the EPS consensus for 2020 has fallen just 4% for thus far on an expected 7% revenue decline. One of the disclosures by Tim Cook on the October ’18 call was that Apple would give the Street a look at Services margin in this coming conference call. Perhaps the 2020 consensus EPS estimate is telegraphing that already. Summary / conclusion: readers should take all opinions and forecasts with a grain of salt, but I expect Apple’s stock to be range-bound for a while, and a lot depends on expected 2020 estimate revisions. It’s no reflection on Tim Cook, but Apple just cannot shoot the lights out every other year for eternity. At some point, the law of “creative destruction” catches up with every company. That being said I do think the healthcare initiative with give Apple another vertical to dominate and could be a secular growth area for Apple, but the speed that this market and the Apple technology that will serve it, develops, is still unknown. When the secular buildout of corporate technology ended in March of 2000, it was at least 10 – 12 years before Cloud, Mobile, Social, etc. gave the previous Tech giants other emerging Tech niches to dominate. Again, it’s not that I’m down on Apple the company, or the stock but look at the history of “expected” 2020 revenue growth: the iPhone giant could be facing mid-single-digit, consumer staples like revenue growth for some time. Apple reports Tuesday night after the bell and Street consensus is expecting $4.17 in EPS on $84 billion in revenue, for expected year-over-year growth of 7% in EPS on a 5% revenue decline. Expect 2019 guidance to be contained.